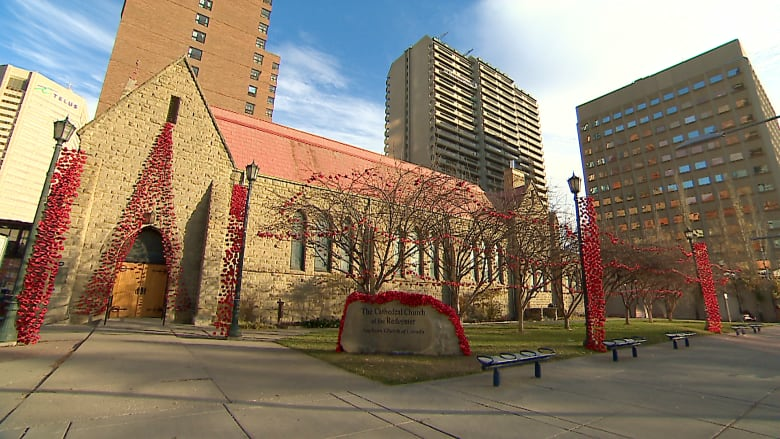 Thousands of knit poppies spill down the outer walls of downtown Calgary's Cathedral Church of the Redeemer, pooling on the grass, and strung along nearby light posts. The installation is an initiative by a group of the church's parishioners to mark the 100th anniversary of the armistice that ended the First World War this Remembrance Day. More than 7,000 poppies represent tens of thousands of hours of work from knitters in Calgary and around the world. "We wanted to do something special to commemorate the 100th anniversary of the armistice, but something that would also … remind people why this church is here — which is to be a beacon of peace and justice for the people of our city," said Leighton Lee, dean of the church. 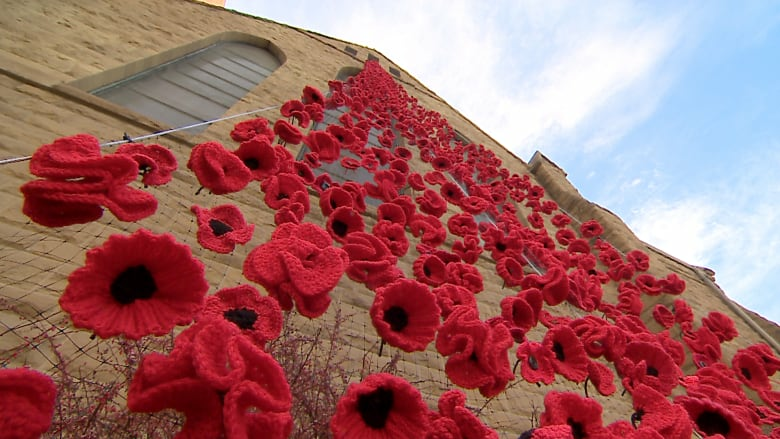 Pippa Fitzgerald-Finch, who came up with the idea for the installation based on similar projects in England, said volunteers spent eight days tying the poppies to bird meshing for the installation. "It came together gradually," she said. "As it became more and more apparent that it was going to look quite spectacular it was a good feeling." Fitzgerald-Finch knit 500 poppies herself. Each poppy took 40 minutes to knit. Lee said it was incredible to see how many people contributed to the project over the past eight months. "It grew really through word of mouth … really people from all walks of life," Lee said. "A friend of the congregation who is Muslim made over 100 poppies, so it really has been a very diverse group of people involved." And he said the response has been fantastic. "It's staggering and wonderful to see how people are responding to this," he said. "But also of course because we are coming close to Remembrance Day to think of what that day means and what it's about. It's very, very heartening to see people responding."